It’s held every year on the 1st November and is one of Mexico’s more well-known public holidays.Images of brightly coloured masks, skulls and skeletons dancing to street music in riotous celebration are what come to mind. Somewhere between Hallowean and Thanksgiving, its an opportunity for families to remember their dead, both personal and well known public figures. 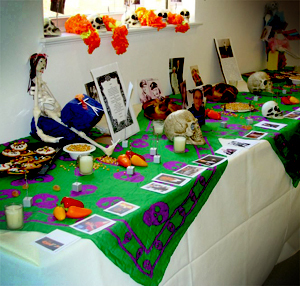 Last week, Jane and I attended The Dying Matters annual Day of the Dead conference in London. I’ve just downed tools at the end of a long edit for a BBC 2 series covering a year in the life of Claridges, an exclusive hotel in the heart of London. We’ve missed a number of deadlines but 12 o clock on Thursday 1st November is absolutely solid one – no more extensions – that’s it .. finito! But its now 12.30 and we’re late. Jane and I are hurrying round the corner of the British Museum looking for the venue of the Dying Matters conference held to coincide with Mexico’s famous day. We’ve been invited to screen the film of Josh’s funeral but I’m still not sure exactly what kind of occasion this is. These days I find that it really doesn’t matter that I have no idea what we might be getting into – should I be nervous about speaking in front of a huge audience, are they professionals, charity workers, or bereaved parents like us. It seems Josh’s death has given me the wherewithal not to care about these things. 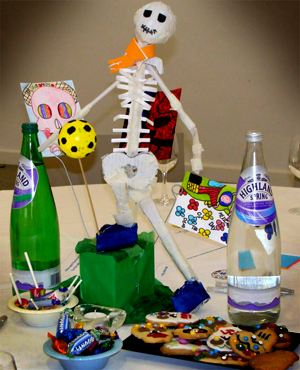 We arrive in a large room with a low false ceiling still relatively empty – strip lights, three large screens along one wall and around a dozen round tables decorated with homemade sculptures modeled on those familiar images of hollowed eye sockets and gaping jaw lines – there are bowls of sweets and plates of biscuits with similar blood dripping themes. In one corner we find the table reserved for speakers. Jane will easily fall into conversation with her neighbour; I enjoy a moment of my own silence among the gathering audience, now numbering close to a hundred. It feels comfortable to be here. There’s a growing buzz of chatter which I am not part of, but then I have always liked that moment when as a child I would drift off into my own reverie secure in the knowledge that the world was carrying on around me. It’s a packed programme of speakers and presentations, power points and sincere deliveries – but the messages pass me by. Something about volunteers to hold the hands of the dying, pathways to a good death, the launch of a form for funeral wishes, a film called “I didn’t want that” which I didn’t quite get. Then Jane and I are standing by the podium, a little apprehensive now about introducing something of a more personal significance. ‘Beyond Goodbye’ has been seen by quite few people – maybe hundreds, perhaps a thousand or so – not exactly a blockbuster but gratifyingly, it does have an audience. It’s been on this site and on Vimeo for nearly a year now, and we’ve had a load of feedback as to how moving and comforting the film is. But this has been from people we either know well, or who are complete strangers. In both these cases people have made a conscious choice to view the film. Now as I stand here, it somehow feels like we are about to inflict our story and our grief on an audience who can’t escape. And I can’t escape my doubt … of what value is this film to people who never knew Josh. 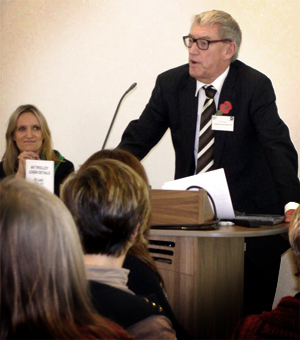 These were professional funeral directors, academics and educationalists, casino online social and care workers, concerned surely with changing policy and attitudes towards death and dying. Why should they want to identify with our grief amongst all others in their lives or the world in general. Then there were those nagging thoughts of what Josh himself would have made of this. All those photos of him on the screens – 3 times over – his coffin, his parachute jump, his aliveness and his deadness. Could he, would he, be happy with this spectacle? In the dark, I’m not so much looking at a film, as reliving the past two years. I can feel the trickle of a tear on my cheek. I brush it away along with thoughts that in exposing him to the world, of exposing his death to all and sundry, we are doing him a disservice. Is there in all this, something shameful about dying? Something so wrong, culpable, especially at such a young age. And do we as Josh’s grieving family carry that shame. Is that what I’m feeling now? I do NOT want the lights to come back on. But they do, in a muted silence followed by a gentle gathering of applause. As I stare fixedly at a paint crack on the wall, I imagine all eyes are on us. Another of the speakers on our table hands me a note – “I’m glad I’m not on next”. The audience has been moved. They have got to know Josh, and us, and his friends and they have found us real. That if anything is the power of showing our film to a live audience, (as opposed to a remote, on line, disconnected viewer) – it makes our lives more real, more accepting of our reality without Josh. 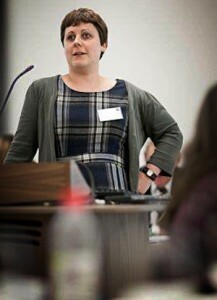 Dr Kate Granger "My doctors wanted to treat me with about eight-ten cycles of chemo'. I put up with five then told them to get lost and went back to work." When the note giver does speak she introduces herself as Dr Kate Granger, an Elderly Medicine Registrar and the author of two books – The Other Side and The Bright Side. She then tells us that 14 months ago she was diagnosed with a rare and aggressive sarcoma which will end her life before too long. Now that she is both patient and doctor, Granger explains that she wants to help health care workers to better understand what being a patient is really like, and how a doctor’s behaviour, no matter how small or seemingly insignificant, can impact massively on the people they look after. Her books recount her personal battle with control, how and when to relinquish it, but Granger herself was an inspiration with her total openness about dying and what it means to her. I must have learnt something about openness when it comes to death as my question to her, ‘how long have you got?’ comes quite easily. The answer was in effect – anytime soon – the average life expectancy of people with this diagnosis is 14 months. Most would put Granger’s composure in the face of such tragic circumstance, as manifest of an extraordinary well of individual courage and positive thinking. But its also true, and as she remarked, it’s those family and friends close to her that are more distressed than she. I can understand this. The perceived nightmare is far worse than the actual nightmare. If the doctors she wants to enlightened are death denying (possibly seeing a patients death as their own personal failure), we too know about a grief denying complex that seems to affect so many of our own acquaintances. Dying Matters exists because of these denials. “Let’s talk about it” the website almost screams. 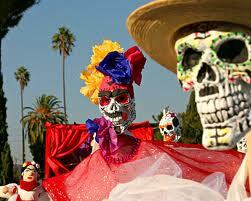 But it feels we have a long way to go before we can have our own “Day of the Dead” here in Britain. 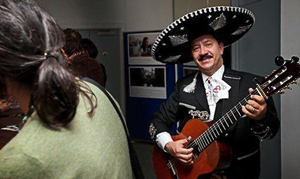 If we don’t go to next years event with Dying Matters, perhaps you’d like to join us for an evening of margueritas, encilladas, and possibly a sombero laden guitarist crooning ‘guantanamera” here in Chalford Hill. The shrine, where attendees were encouraged to post photos and memories of their loved ones.